Since this is as close to spring as we get in Southwest Florida, most of us are looking for ways to give our homes a little freshening up! Some decluttering. And maybe a couple of home projects that we have been thinking about since the holidays. Something about spring, wherever we live, always gives us a nudge to shake things up a little. And even if budgets are tight, you can still do a little decorating to make an impact. Add spring color with vintage glass pickling jars from Pottery Barn. Embroidered starfish pillow from Pottery Barn. • Romance the bedroom. Spring is the perfect time of year to purchase new linens. Comforters and duvets in beautiful colors. Sheets. Throw pillows. A quilt in an accent color. And two new lamps. Maybe a new fabric headboard in an accent color. • Lighten up. Add dimmers to all of your lighting. This is also a good time to begin switching your incandescent light bulbs with dimmable LED bulbs. Yes, they are pricey but give a cooler, whiter light. And will reduce energy bills over the extensive lifetime of the bulb. • Freshen up fabrics. Reupholster or have slipcovers made for that couch or chair that you still love but is looking a little faded. Maybe it is time to takedown the drapes and switch to blinds or shades. Or make some window cornices. There are great instructions online and you can splurge on some beautiful fabric with the dollars you will save by making the cornices. • Do some painting. Not the entire house but just the entry or family room. Try something different. If your colors are neutral, paint an accent wall (it is only paint and can be changed if you don’t like it). Or if you have tried tropical colors for a while, try something beautiful and neutral like one of my favorites: Benjamin Moore’s Silver Satin. It is a nice change and you can literally use any accent color with it. 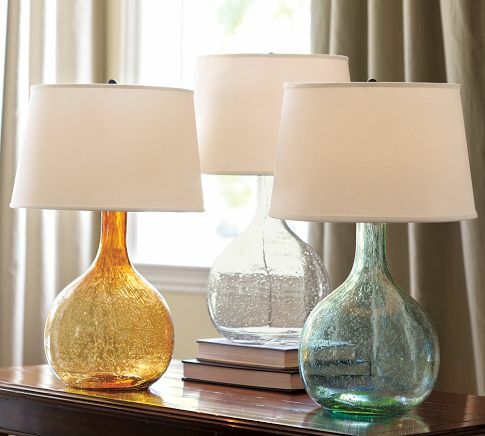 Glass lamps from Pottery Barn for end tables or nightstand. • Give your bath a spa makeover. Include fresh paint from Benjamin Moore’s Whites. Update fixtures. Try double towel holders and you will thank me! Purchase a new spring showerhead. Splurge on new towels and bathmats. Replace the medicine cabinet. Try new scented candles. Treat yourself to fresh flowers. • Move it around. You can’t add more square footage to your rooms but you can make them appear larger. Take a good look at your space. If you have too much furniture, accessories, photos, books, anything, thin things out a little and make your rooms appear more open and brighter. Less really is more when it comes to our homes.